Coding. It’s not a word we used 10 or 15 years ago in education, but it’s a word you need to know now. In simple terms, coding is telling a computer what you want it to do by typing in step-by-step commands for it to follow. Did you know that in the next 10 years…. There will be 1.4 million programming jobs up for hire, but only 400,000 jobs in Computer Science will be filled. This leaves 1 million jobs available. 1 million jobs open for YOU or YOUR students. Only 1 in 10 schools are currently teaching computer science. 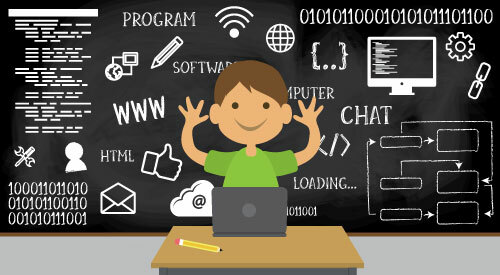 Here are FIVE reasons why your students need to learn how to code. Students learn from their mistakes. When making a mistake, students usually think about them emotionally. This creates the idea of “I’m dumb”. Imagine a classroom that was fully engaged due to students constantly understanding where they went wrong and choosing to “rethink” their thoughts to create a new conclusion. Students will learn not to fear their mistakes or failures. The pressure of never messing up begins early in a child’s life. Much of this pressure comes from school and grades. Coding enables students to understand that mistakes are okay. n fact, they’re great! With every mistake comes the opportunity to fail forward and grow. Success is a scribbly line. There isn’t a black or white answer for success. Coding gives students the opportunity to find success in multiple ways through each step-by-step process they complete. Persistence pays off. We all know that giving up is taking the easy way out. To persevere through tough situations teaches students an invaluable life lesson. Life won’t always be easy. When it gets hard, push through it! That’s what makes each life experience so valuable. Teamwork is important. Students will learn how to work with each other while building relationships. Foster a sense of accomplishment and camaraderie among your students. This is a feeling you can’t experience by doing everything solo. Join us in celebrating Computer Science Week, December 5-11 by integrating coding into your classroom! Check out this great list of multimedia resources you can immediately begin to implement with your students.